In Germany there are numerous types of doctors, from general practitioners (Hausärzt) to specialists such as cardiologists, dermatologists, etc. Most people have a Hausarzt as their family doctor, who will make referrals to a specialist if necessary. You can also visit a specialist without first consulting your family doctor. It is always recommendable to make an appointment (Termin) as waiting times can be long. If you need urgent help, you go without an appointment during office hours, but expect to wait. Otherwise you may have to wait several days or even weeks, especially to consult a dentist or specialist. Even with an appointment, you will find you probably have to spend some time waiting. Normal surgery hours and appointment times can differ considerably but are usually every morning, but not every afternoon. Few surgeries open on Saturdays and on Sunday. During holiday times most doctors have a locum in to cover for them. Names and addresses of doctors can be found in the local telephone directory, specialists are listed in the yellow Pages (Gelbe Seiten) under Ärzte. You are free to choose which doctor you wish to go to. Note that German doctors are not particularly open to discussions and questions about your treatment, but expect you to follow their recommendations. Most doctors will speak some basic English, but you can also contact your embassy or consulate for a list of doctors who speak English or your native language. If you have German health insurance, your insurance company will give you a plastic ID card which you need with you when you visit a doctor (Krakenversicherungskarte). This card contains a chip with your personal data which the doctor's secretary will screen on your first visit. Statutory health insurance accreditation (Kassenzulassung) means that costs will always be covered by the insurer. If you are state insured, the doctor will send his bill directly to your insurance company. You will also be charged a fee of €10 for your first visit every quarter, payable in cash. If you have a private insurance, you pay and are then reimbursed by your insurance company. Note that some doctors only treat privately insured clients. If you have state insurance, make sure you check this when making an appointment. Doctors who accept state payments generally display a sign Kassenarzt or Alle Kassen in their surgery. If you're treated by anyone other than a Kassenarzt, you will not be reimbursed by the state insurance scheme. See our section on health insurance for further details. Regular preventative medical check-ups are recommended, in particular for young children and people over 35 years. You should also visit the dentist regularly. Doctors, hospitals and health offices provide information on preventative check-ups. Here is the search engine of the National Association of Statutory Health Insurance Physicians. Recent reforms in the state insurance system have greatly reduced the cover for dental treatments. Even with private insurance, you may not be fully reimbursed for every type of treatment as statutory health insurers only cover basic dental care. When choosing a dentist, check with your insurance company the exact details on reimbursement. Consider getting a written estimate of all costs from a dentist before accepting treatment. Since dental costs in Germany are extremely high (a set of dentures can cost up to €4000! ), many foreigners schedule dental visits during their trips home. Due the recent cuts in insurance schemes, some Germans even travel to other European countries for treatment. As treatment will probably be cheaper at home, so get a full check-up before coming to Germany. If you don’t have additional dental care, expect to pay between 30 and 80% of your dental treatments. Here is the search engine of the National Association of the Statutory Health Insurance Dentists. Many doctors have additional specializations in natural cures such as acupuncture, ozone therapy and homoeopathy. Health insurance companies have recognized the efficacy of such treatments and cover some costs when treatment is given by a registered doctor. If this interests you, compare how different health insurance companies support alternative medicine. You should also contact your insurer before you start treatment to check whether and how much of the cost is covered. 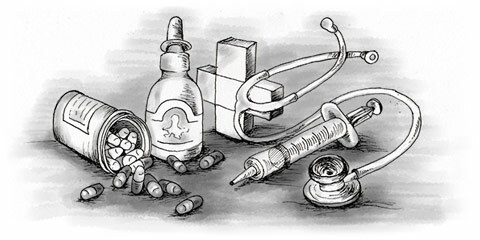 Health insurance - state or private - generally does not cover treatment by a homeopath or alternative practitioners. If you want such treatment, you should see a registered general practitioner that offers these services. For the latest news regarding doctors and healthcare in Germany, visit our website on expatriate healthcare: http://www.expathealth.org .